Usually when the Bioscope comes across interesting and relevant texts on silent cinema which are freely available online, they get described and placed for future reference in the Bioscope Library. In the case of Robert S. Lynd and Helen Merrell Lynd’s Middletown: A Study in Modern American Culture, the main body of the book has relatively little to do with cinema per se, but it has three or pages of real interest to us, so I’m reproducing the entirety of that text here (while still putting it in the Library). Middletown is a classic sociological study, published in 1929 (with a sequel, Middletown in Transition, published in 1937). ‘Middletown’ was the name the Lynds gave to an archetypal small American city, which could be looked upon as a model example by which to examine sociological trends. 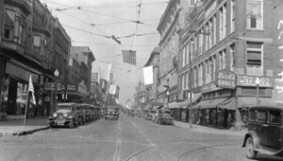 The city chosen was Muncie, Indiana, population 38,000 at the time of the study, which began in 1924 and looked at changes undergone in this small Midwestern city between 1890 and 1925. Middletown was instantly recognised as a classic study, and it has enjoyed enduring influence and popularity down to the present day. The Lynds studied Middletown under six main social activies: Getting a living, Making a home, Training the young, Using leisure in various forms of play, art, and so on, Engaging in religious practices, Engaging in community activities. In the area of leisure time, their main thesis was that time for leisure had increased, but that much of this new leisure time was spent on ‘passive’ recreations, such as the cinema. The evidence presented on the place of cinema in America in the mid-1920s is rich in interest and meticulously-researched detail. One may feel a little uneasy at the mass audience being examined under the microscope like this, but there is also a heartening sense of that audience delighting in an entertainment that belonged to all, untroubled by those dwindling forces in society that might wish to clean up or close down its simple joys. Like the automobile, the motion picture is more to Middletown than simply a new way of doing an old thing; it has added new dimensions to the city’s leisure. To be sure, the spectacle-watching habit was strong upon Middletown in the nineties. Whenever they had a chance people turned out to a “show,” but chances were relatively fewer. Fourteen times during January, 1890, for instance, the Opera House was opened for performances ranging from Uncle Tom’s Cabin to The Black Crook, before the paper announced that “there will not be any more attractions at the Opera House for nearly two weeks.” In July there were no “attractions”; a half dozen were scattered through August and September; there were twelve in October. Today nine motion picture theaters operate from 1 to 11 P.M. seven days a week summer and winter; four of the nine give three different programs a week, the other five having two a week; thus twenty-two different programs with a total of over 300 performances are available to Middletown every week in the year. In addition, during January, 1923, there were three plays in Middletown and four motion pictures in other places than the regular, theaters, in July three plays and one additional movie, in October two plays and one movie. About two and three-fourths times the city’s entire population attended the nine motion picture theaters during the month of July, 1923, the “valley” month of the year, and four and one-half times the total population in the “peak” month of December. Of 395 boys and 457 girls in the three upper years of the high school who stated how many times they had attended the movies in “the last seven days,” a characteristic week in mid-November, 30 per cent, of the boys and 39 per cent of the girls had not attended, 31 and 29 per cent, respectively had been only once, 22 and 21 per cent, respectively two times, 10 and 7 per cent, three times, and 7 and 4 per cent, four or more times. According to the housewives interviewed regarding the custom in their own families, in three of the forty business class families interviewed and in thirty-eight of the 122 working class families no member “goes at all” to the movies. One family in ten in each group goes as an entire family once a week or oftener; the two parents go together without their children once a week or oftener in four business class families (one in ten), and in two working class families (one in sixty); in fifteen business class families and in thirty-eight working class families the children were said by their mothers to go without their parents one or more times weekly. In short, the frequency of movie attendance of high school boys and girls is about equal, business class families tend to go more often than do working class families, and children of both groups attend more often without their parents than do all the individuals or other combinations of family members put together. The decentralizing tendency of the movies upon the family, suggested by this last, is further indicated by the fact that only 21 per cent, of 337 boys and 33 per cent of 423 girls in the three upper years of the high school go to the movies more often with their parents than without them. On the other hand, the comment is frequently heard in Middletown that movies have cut into lodge attendance, and it is probable that time formerly spent in lodges, saloons, and unions is now being spent in part at the movies, at least occasionally with other members of the family. Like the automobile and radio, the movies, by breaking up leisure time into an individual, family, or small group affair, represent a counter movement to the trend toward organization so marked in clubs and other leisure-time pursuits. How is life being quickened by the movies for the youngsters who bulk so large in the audiences, for the punch press operator at the end of his working day, for the wife who goes to a “picture” every week or so “while he stays home with the children,” for those business class families who habitually attend? Over against these spectacles which Middletown watches today stand the pale “sensations” of the nineties, when Sappho was the apogee of daring at the Opera House: “The Telephone Girl – Hurricane hits, breezy dialogue, gorgeous stage setting, dazzling dancing, spirited repartee, superb music, opulent costumes.” Over the Garden Wall, Edith’s Burglar, East Lynne, La Belle Maria, or Women’s Revenge, The Convict’s Daughter, Joe, a Mountain Fairy, The Vagabond Heroine, Guilty Without Crime, The World Against Her (which the baker pronounced in his diary, “good, but too solemn”), Love Will Find a Way, Si. Plankard. These, it must be recalled, were the great days when Uncle Tom’s Cabin, with “fifty men, women, and children, a pack of genuine bloodhounds, grandest street parade ever given, and two bands,” packed the Opera House to capacity. Some high school teachers are convinced that the movies are a powerful factor in bringing about the “early sophistication” of the young and the relaxing of social taboos. One workingclass mother frankly welcomes the movies as an aid in child-rearing, saying, “I send my daughter because a girl has to learn the ways of the world somehow and the movies are a good safe way.” The judge of the juvenile court lists the movies as one of the “big four” causes of local juvenile delinquency,  believing that the disregard of group mores by the young is definitely related to the witnessing week after week of fictitious behavior sequences that habitually link the taking of long chances and the happy ending. While the community attempts to safeguard its schools from commercially intent private hands, this powerful new educational instrument, which has taken Middletown unawares, remains in the hands of a group of men – AN ex-peanut-stand proprietor, an ex-bicycle racer and race promoter, and so on – Whose primary concern is making money. Middletown in 1890 was not hesitant in criticizing poor shows at the Opera House. The “morning after” reviews of 1890 bristle with frank adjectives: “Their version of the play is incomplete. Their scenery is limited to one drop. The women are ancient, the costumes dingy and old. Outside of a few specialties, the show was very ‘bum.’ When Sappho struck town in 1900, the press roasted it roundly, concluding, “[Middletown] has had enough of naughtiness of the stage … Manager W – will do well to fumigate his pretty playhouse before one of the dean, instructive, entertaining plays he has billed comes before the footlights.” The newspapers of today keep their hands off the movies, save for running free publicity stories and cuts furnished by the exhibitors who advertise. Save for some efforts among certain of the women’s clubs to “clean up the movies” and the opposition of the Ministerial Association to “Sunday movies,” Middletown appears content in the main to take the movies at their face value “a darned good show” and largely disregard their educational or habit-forming aspects. 17. Exact counts were made for only January, July, and October. There were less than 125 performances, including: matinees, for the entire year. 18. These figures are rough estimates based upon the following data: The total Federal amusement tax paid by Middletown theaters in July was $3002.04 and in December $4,781.47. The average tax paid per admission is about $0.0325, and the population in 1923 about 38,000. Attendance estimates secured in this way were raised by one-sixth to account for children under twelve who are tax-free. The proprietor of three representative houses said that he had seven admissions over twelve years to one aged twelve or less, and the proprietor of another house drawing many children has four over twelve to one aged twelve or less. These attendance figures include, however, farmers and others from outlying districts. 19. The question was asked in terms of frequency of attendance “in an average month” and was checked in each case by attendance during the month just past. Lack of money and young children needing care in the home are probably two factors influencing these families that do not attend at all; of the forty-one working class families in which all the children are twelve years or under, eighteen never go to the movies, while of the eighty-one working class families in which one or more of the children is twelve or older, only twenty reported that no member of the family ever attends. 23. One exhibitor in Middletown is a college-trained man interested in bringing “good films” to the city. He, like the others, however, is caught in fthe competitive game and matches his competitors’ sensational advertisements. Middletown is available from the Internet Archive in DjVu (30MB), PDF (33MB) and TXT (1.3MB) formats. There’s more on the influence of motion pictures on Middletown society throughout the book, which is marvellous window on a society, easy to read and enticing in all its detail. If you are interested in finding out more about Middletown itself and the studies that came out of it, there’s a Centre for Middletown Studies at Ball State University, Muncie, which continues the research work and has a wide range of background information and digitised resources.